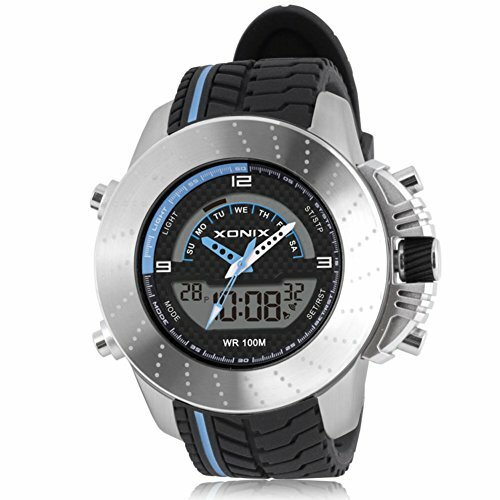 1.Racing LED digital waterproof cool watch designed for you who is addicted to racing and sports. 2.Equipped with alarm, calendar , stopwatch ,LED,Waterproof ,Dual Time,Dual Display,12 or 24 Display and Hourly Time Signal and so on. 3.Can see time clearly in the dark with back-light. 5.100 M water resistant is convenient for daily life. 6.This is a fantastic present for your relatives and friends. 7.A variety of colors can meet the needs of different people. Good After Sale Service: If you have any problem,please feel free to contact us,we will try our best to solve?your?problem. Especially Designed For Racing:The Watch Absorbs Many Racing Elements,Fully Reflect Speed And Passion,Unique Design Style Give You Special And Cool feeling. Material: High-quality Electronic Movement, Comfortable And Soft Silicone Strap ,Provide Comfortable Wearing Experience For you. Multi-function:Calendar month / Day / Date, Alarm, Water resistant, Led display, Back light, Shock resistant, Stop watch,Countdown，Alarm,Hourly time signal,Dual time,12 or 24 display,Ect. What you waiting for? This a great value watch you don't want to miss. A perfect gift:High quality but low price,Multi-function racing watch,It is absolutely a perfect gift for your friends or relatives!! !